Ron Anderson is one of those avant rock legends most of you people out there may not have yet heard of, although 1. he recorded already more than 40 CDs, 2. he once played only ten minutes away from where I live and I still missed the show (I'm still mad at myself), and 3. he played already with Mark Ribot, Otomo Yoshihide, John Zorn and Ruins, just to name a few. 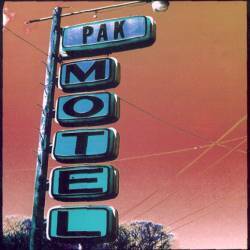 PAK is one of his more recent bands, only founded in the early millennium, and Motel is the second CD by that band, where guitar virtuosi Anderson is backed up by the crazy rhythm section of bass player / vocalist Jesse Krakow (Time Of Orchids) and drummer Keith Abrams. PAK are a three-piece on paper only though, as they have invited lots of guest musicians, where especially violinist Carla Kihlstedt (Sleepytime Gorilla Museum) and trumpet player Time Byrnes (Candiria, Friendly Bears) are notable. The opener You Like It Like That already shows the direction this CD is taking. The music is angular, jarring, hectic, crazy, with Krakow barking his vocals over Anderson's intricately played guitar tunes that are impossibly surrounded by the rhythm section, by the use of the weirdest time signatures like 13/8. You won't be able to sing along, but can only abandon you to this musical genius. Carla Kihlstedt's violin is adding a lot of colour to that song, as well as to The Higher The Elevation The Lesser The Vegetation, a piece sounding like taken from King Crimon's Starless And Bible Black album. The two long pieces Every Body Likes You and Bienvenue à l'Hôtel Plastique give the band more room for their semi-improvisational free jazz sounds. Backed by trumpet and saxophone, these tracks combine the sheer intensity of rock music with the beatnik sounds of jazz as played in a smoky club. Motel is never an easy album to listen to, but it is showing me that Europe is musically still conservative compared to New York, where a John Zorn showed already more than a decade ago that combining jazz and grindcore can be cool, and where a band like Sleepytime Gorilla Museum is innovating the prog genre while Europe seems to be asleep. Motel is a daring album, a bit heavy to digest at times, but if you want your math rock infused with a heavy dose of jazz, and a pure undistilled production, that this is the point where you need to start.